The selection of call outs detailed below give an idea of the nature of the Team’s work. Sometimes the most serious accidents happen when you least expect them. The account below, from STV news, describes one such accident. A woman who lost her leg in a climbing accident is raising money for mountain rescuers who helped save her life. 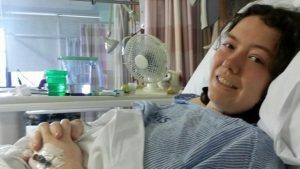 Emily Woodroofe was climbing in the Torridon area of the Highlands on March 23 when a boulder came loose and landed on her leg, pinning her underneath. Seriously injured and fearing for her life, the medical student guided her friends through the steps necessary to keep her alive while they waited for help to arrive. Volunteers from the Torridon and Kinlochewe Mountain Rescue Team were among the first on the scene. Ms Woodroofe was treated in Inverness before being flown to St Mary’s Hospital in London. Doctors initially believed they would be able to reconstruct her leg from muscle on her back but it soon became clear it was too badly damaged and would have to be amputated. Ms Woodroofe has raised more than £3500 for the Torridon and Kinlochewe Mountain Rescue Team so far. The call came at 2 am and I dragged myself out of bed. Two climbers were overdue from the grade III gully called George in Coire Dubh Mor on Liathach, a route that I have done on dozens of occasions. Muster time was 6am at the team base in Torridon Youth Hostel. I instantly knew that this was a serious shout. I had been retreated from An Teallach the previous day in conditions both wild and dangerous with huge build-ups of drifted snow. The overnight weather forecast was appalling with a “polar low” due to give blizzards and storm-force winds. Our immediate assumption was that the climbers had been avalanched at some point. Andrew Johnston was acting as coordinator. He gave us the bare bones of information. The wife of one had raised the alarm when they had failed to arrive at the hostel as planned on Friday evening. The two friends had travelled up on Thursday night for a weekend’s climbing. 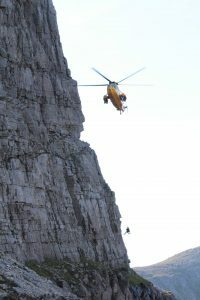 Helicopter assistance was unlikely for several hours, so a foot search was launched. Six of us were assigned to walk round the back of the mountain and climb into Coire Dubh Mor to approach the route. Three others, led by Jim Sutrherland, would go up the south side to check likely descent routes. Throughout our searches the prime concern was to avoid placing ourselves in unnecessary danger. At 6.30am we left the Coire Dubh car park, wrapped up to the hilt. Ryan led for a way until the path disappeared under deep drifts a hundred metres up. Mark and I took over and we staggered blindly in the storm. Ferocious cross-winds knocked us over every minute or so. The task ahead seemed overwhelming. The march to the steeping stones in Coire Dubh, a fifty minute jaunt in dry conditions, took us over two hours, but the dawn gave us better orientation. Emily and Ronald remained in the lee of a large boulder to provide a radio link round the back of the mountain as necessary. I didn’t envy them as they donned down jackets and hunkered down under a group shelter. All the way through the valley the snow was knee-deep and akin to a wet quicksand, sucking the life out of the legs. However, visibility was improving. The worst of the storm had moved through. I began to believe that we could do something useful. Mark is a fit warrior. He and I took turns to forge a trail while Ryan and Charlie handled the radio communications. After three hours we reached the corrie. A quick scan for recent avalanche debris revealed nothing. Perhaps they had bivouacked in the route. There is a cave at the crux which could provide some shelter. Cautiously, we probed higher, digging out snow pits to check for active windslab. The further we went the more confident I felt. The fresh snow, though thigh thigh-deep in places, revealed no tendency to fracture. Naturally, there was reluctance at base to give us the green light to climb higher, but we impressed Andrew that we could reasonably scout the gully and then traverse out to the north ridge of Spidean a’Coire Leith. Charlie and Ryan stayed back to be available to traverse into Coire na Caime if needed there. Moving one at a time Mark and I ploughed between islands of rock. Soon we could see the whole route. It was empty. The mountain now revealed its full profile, blasted clean by the storm with every nook and cranny etched in wind-packed snow. The puzzle of the missing climbers was now as absorbing as it was troubling. Avalanche was no longer the only scenario. A fall on descent was as likely, and in the teeth of a hurricane the climbers would almost definitely have descended from the exit of the route direct into Coire na Caime rather than trying to get over the summit. Mark and I climbed swiftly up Spidean’s north ridge. At the exit of George we found two tangled ropes and the remains of sandwiches. Our suspicions were confirmed. The two climbers must already have been desperate to have dumped their ropes. We reported the find and suggested an immediate switch of operation to Coire na Caime. With its lochan jewels and ice-scraped terracing this is most the lovely of mountain corries but can turn into a desperate trap in the teeth of a storm, with no path out and no phone signal. Charlie and Ryan began a horizontal traverse round into the corrie. Stornaway Coastguard helicopter was now on scene and would collect more rescuers from Torridon base. For Mark and I the priority was to check for tracks over the summit. It was important to eliminate that lingering possibility. As we cramponned up the final ridge the NW wind still blew in occasional gusts of 50mph. We found old crampon scrapes around the summit cairn and scouted the “false line” towards Pyramid Buttress where climbers might have strayed and fallen, but there was no conclusive evidence of recent activity. We decided to complete our mission by descending the normal route down the “bum-slides” from the col east of Spidean’s summit. We dug a test snow-pit and again we found no layering. I launched down first. The ride was exhilarating. Within 5 minutes we were 250 metres lower. Nowhere was there any avalanche debris or recent tracks. For us the last hours had been an intriguing and, dare I admit, satisfying piece of mountaineering. Despite the dread narrative that underlay our mission, we were pleased that on this rescue our efforts had made a genuine contribution to a resolution. So often they don’t. Then we heard a burst of activity on the team radio. One of the two missing climbers had emerged at Coire Dubh car park and Gerry McP had picked him up in the team bus. He was weak and mildly hypothermic but otherwise unharmed. He had left his friend in Coire na Caime where they had bivouacked through the storm. We dared to believe that both had survived. All that was needed was a quick airlift and this story could end in triumph. Our spirits soared. “Tell him that we have got his ropes,” I blurted out in sheer relief. Mark and I swooped down the second series of bum-slides and reached the road in 40 minutes. Back at the hostel the climber was re-warming, wrapped in a down jacket, his feet in a warm footbath. He recounted his epic. His friend was the more experienced climber but they had endured a terrible battering from spindrift in the gully. They descended direct to Coire na Caime in darkness and his pal was avalanched on the way down, sustaining minor head injuries. They had bivouacked behind a boulder and he had left to seek a rescue when the wind started to drop at 8am. We could imagine how desperate a night this had been. The helicopter reported that they were returning with victim and rescuers. With a severely hypothermic patient they would doubtless go straight to Raigmore Hospital. Meanwhile, the first survivor was taken off by the warden to have a shower and change of clothing. Then Gerry took a second radio call from the pilot, and he emerged with solemn face. The outcome was not good. The helicopter paramedic could detect no signs of life. Our hopes were dashed. There seemed little more that I could do. There were several team members on hand to help deal with the situation and I had nine new course clients arriving in just a few hours. I needed to recover some spirit and strength for an evening of cheery meeting and greeting. Yet I little imagined what trauma was still to come. The helicopter landed as I drove off. The prognosis was so certain that, instead of heading to hospital, they unloaded the casualty outside the hostel. Almost simultaneously, the wives and parents of the victims arrived at the hostel, unaware of the outcome. The stretcher was taken into the warden’s house where Gerry was able to confirm the death. Other members looked after his friend and the families in the hostel, and then Gerry had to give them the dreaded news. Usually, rescuers can maintain a degree of detachment from the personal drama of a fatality but not in this case.